Lindsay Mason: feline fine after my trip! Hello folks, I really hope this post works, as everything is going bonkers with blogger (for me anyway!) since David had to change the feed...I think that's what he did anyway! Last week I couldn't publish what I'd written and now, after I uploaded all my pictures, everything that I typed came up bright blue and underlined! So...I have deleted the pictures (hoping they are still on my computer somewhere!) and am now doing the text and will try to insert the pictures afterwards. The only clue I can find about the underlining is that it's somehow connected to photos, so we'll see. What a palaver! Anyway, I had a great trip to In 2 Crafting in Wickford, near Basildon. 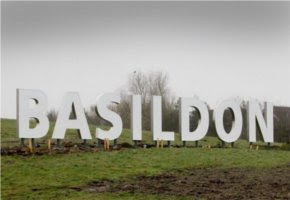 This is Basildon's version of the Hollywood sign, though it's somewhat smaller....quite a bit smaller! See Heather - I told you there was a Hollywood style sign there! I had a trot round the town and then went to my hotel which is on an entertainment park with restaurants and a big cinema. It was a much quieter night than usual there as they have closed down the nightclub through noise complaints! I had a stroll around the lake and fed a few birds, then it was a bite to eat and a relaxing night in. The hotel has recently upgraded their rooms and this included HD tv's. I've never watched anything on HD before and have to say that I was very impressed - I watched an animated film called The Legend of the Guardians (all the characters are owls) and hardly followed the plot as I was just transfixed by the amazing picture! Lol! Anyway, after a comfy night's sleep (this one made up for the horrors of the Eastbourne hotel!) it was down to work on Saturday. Réne and John have new premises now and the shop is really bright, airy and spacious. I was busy all day and the ladies and I had so much fun, with lots of giggles all day, just how I like it! I was showcasing stamps as well as Distress Stains, Tissue Tape, My Mind's Eye papers and more. The Stains are becoming more interesting each time I work with them. Here I dragged them over my craft sheet, spritzed on a little water and a few sprays from the Perfect Pearl Mist (ie the "white" one) and then dragged white card through it. This gives a hazy background with a lovely shimmer. I used this with my "I dreamed of castles" and "Hoist the Flags" stamp sets, before matting onto card that I'd punched with the MS PATP Vintage Lace. Once punched I coloured it with the Spun Sugar Stain. The message is from my "Happy Anniversary" stamp set which has four assorted verses on it. I coloured the castle and the four extra towers using pale pink and blue Memento pens before assembling them and finishing with Crystal stickles on the roofs. The bunting was stamped directly onto the card and then, again, onto white gloss card. I coloured each bunting flag with Memento pens, cut them out and layered over the ones on the card. The Castle stamps can used to create cards for anyone - pink and glittery for little girls, masculine colours for men, Gothic style for teens etc. This, however, was everyone's favourite card on Saturday! It's made using my "Rose Galore" stamp set, which has the rose background, single rose and row of borders. The sentiment is from my "Sending words of love" set. The background roses were stamped with black Memento ink and then coloured with a solvent based pen. I stamped the row of flowers onto seperate white card and then joined the two pieces together, hiding the join with ribbon that I'd dyed with Distress Stains. I stamped and embossed the verse with detail silver. Tissue tape down the side of the card and the single rose stamped, distressed and cut out, was the finishing touch. Here's a large 8" x 8" card which I covered with MME Lost & Found glittered paper before embellishing with stamps from Andy Skinner's Stitch in Time set. I added a pleated Tissue Tape band down the side, an acrylic fragment, needle threader and some thread which I formed into a mini skein and held in place with more Tissue Tape. The "pretty" panel is from another Lost & Found sheet and I edge it with dyed ribbon. The Lost & Found papers are really pretty but have that distress touch as well. Several of the ladies at In 2 Crafting asked me what was happening with the pusscat who seemed to be in the process of adopting us! Well, at the moment, he is luxuriating on David's lap! We will be taking him to the vet to check if he has a microchip or to see if they know of anyone who has lost him. He has, meanwhile, well and truly made himself at home! Here he is on the first day that he came inside....along with all the bits of grass and earth that he stomped in with him! He now stays in overnight and goes out in the morning, whereupon, after about half an hour, he yowls as if he has been treated most cruelly and continues until he is let back in. He's no trouble though......very happy to just sit on a vacant (or otherwise!) lap, or cuddle beside me on the sofa. He has become a bit of a kitchen doorstop though, parking himself there at the merest hint of food being prepared! Not surprising really when he had obviously been fending for himself for some time. He does dribble a lot though - I think it's because he has a slightly wonky mouth. One very contented pusscat! Shame you can't hear the purring which I think could possibly be heard from three miles away at it's loudest! Do you think he's decided that he's landed on his feet? He hasn't got a mucky nose by the way, that's just his markings! He's a big cat, but he has a very loving personality and is a real softie, though he has nipped me a couple of times....his way of telling me which parts of his legs are "off limits"! I have also rediscovered the joys of cat hairs on black skirts and pinprick holes in skin due to kneading from feline feet! So, that's where things are at the moment. He doesn't have a name yet - though Joanne named him Naan straight away! I like a two syllable cat name and am waiting till we know for sure that he hasn't got someone pining for him and to see what suits him. Will keep you posted of course! So, it's a busy week ahead just for a change! I'm still working on those new designs with an ever looming deadline and have to make samples for Saturday when I'll be demonstrating on Crafty's stand at the Port Sunlight show. Then, on Sunday I'll be teaching with Amy Shaw at our joint workshops day. We have just a couple of places left if you'd like to come along and join the fun - just contact either of us for more details. Hope to see some of you at the weekend. I'll be posting some pictures tomorrow to join in the fun on Joanne's Crafting Buddies blog, so please do pop by to take a look. Lastly, welcome to new followers and hope you enjoy my ramblings! Fabulous cards - I really,really love the roses and may have to treat myself to the stamps (having managed to buy the two of the last sets of Andy's stamps at A Maze of Memories yesterday). I do think the cat has landed on his feet - he certainly seems at home! Kitties drool when they are so contented that nothing else better could happen to them, my little girl drools when i am in bed with my winter snuggly fleece blanket, guess it feels good on the toes! Hiya, really like the cards that you've made and your new friend looks very contented :0. Hope David is feeling better! It looks like Wasabi's long lost brother has turn up at your doorstep. Awh little Naan really does look content. I hope someone isn't missing him and that you get to keep him 'cos I know he will have a super, spoilt (in the nicest way) life. My fave card is the rose one too. When I helped with the ATCs, those images threw me but once I looked at them a second time they became my overall favourites, oh! and the hearts and wings and the mermaid and the ............Now then, is there still a space on Sunday? Put my name on it if so. Ah I thoink you have a new puddy cat!!!! He looks lovely. I must get a picture of Tilly Mums cat as she too has funny "dirtynose" markings!!! Enjoy the time with him as he has chosen you to be his servants!! !